Chuka Umunna says the leadership question is "settled"
The election has been lost and won but today's work isn't done for the Labour Party's NEC. The National Executive Committee is meeting to decide whether or not to hold elections for the shadow cabinet. Earlier this month MPs backed a proposal to allow them to have a say. The MP who suggested the rule change, Clive Betts, said the measure would be "pragmatic". Mr Corbyn's supporters say the push for shadow cabinet elections is an attempt to curb his power. ITV's Vincent McAviney spoke to the party's deputy leader before the meeting began - his response gave little away. Salford and Eccles MP Rebecca Long Bailey, part of Jeremy Corbyn's shadow cabinet, told the BBC's PM programme on Radio 4 that Labour MPs must "get on with their jobs" after the leadership challenge and election. "All of us have to press the reset button, as it were, and draw a line under what's happened," she said. "I think that's the opinion of most of my PLP colleagues, certainly the ones that I've spoken to. They just want to get on with their jobs, taking the fight to Tories and representing the people that elected them, because that's the only way that we're going to win a general election in 2020." Scottish Labour leader Kezia Dugdale tells the BBC she believes a UK party led by Jeremy Corbyn can win a general election. 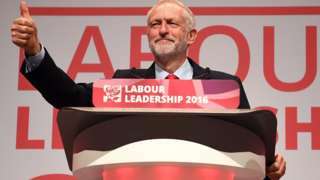 Mr Corbyn has promised to "reach out" to his party critics and told the BBC there will be "a lot of changes over the next few weeks"
Video caption: How the Labour result was announced, with the speech of re-elected leader Jeremy Corbyn.How the Labour result was announced, with the speech of re-elected leader Jeremy Corbyn. Video caption: Defeated leadership candidate Owen Smith is to think "about what my future looks like".Defeated leadership candidate Owen Smith is to think "about what my future looks like". 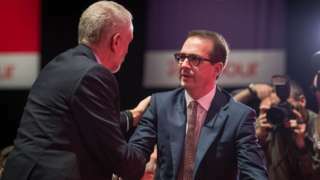 Labour leadership challenger Owen Smith congratulates his opponent Jeremy Corbyn, saying he won a decisive victory. How does Jeremy Corbyn's vote share compare to past Labour leaders? Jeremy Corbyn slightly increased his percentage of the vote to 61.8%, compared to 59.5% last year. That compares well with his predecessor, Ed Miliband, but it isn't the biggest mandate a Labour leader has obtained. Dave Prentis, general secretary of Unison, said Jeremy Corbyn had inspired the membership, but added: "Jeremy must show those sceptical about his leadership that he has the ability and the ideas to win an election, and enable Labour to regain the support of the British people." Len McCluskey, leader of Unite and a Corbyn supporter, said the party's MPs should now listen to its members and stop the "sniping, plotting and corridor coups". Mr McCluskey added: "I hope that all the talents of the party can now be harnessed and MPs return to serve in the shadow cabinet as Jeremy builds the alternative government the people of this country dearly need." Labour MP John Woodcock, an opponent of Jeremy Corbyn, has drawn a comparison between Mr Corbyn's leadership and the regime of Big Brother and the Ministry of Truth in George Orwell's dystopian political satire 1984. "For those Labour supporters who are disappointed by this result, my message is this: don't give up, don't walk away and don't stop making the case for the kind of party that can change the lives of the many who need a Labour government," he said. Quote Message: As Winston Smith once said in 1984, two plus two still equals four, no matter how many people say you now have to accept that it equals five." As Winston Smith once said in 1984, two plus two still equals four, no matter how many people say you now have to accept that it equals five." The MP, who represents Barrow and Furness and backs the renewal of Trident, added: "I will be focusing on making the case for everyone to benefit from the work we have secured on the successor submarines, on the need to keep vital services at Furness General, and on ways to raise the aspirations and attainment of our young people who still lag behind in many other areas." A profile of Jeremy Corbyn - the radical left wing MP who has now seen off a challenge to his leadership of the Labour Party. Scottish Labour leader Kezia Dugdale has told the BBC she believes a Labour Party led by Jeremy Corbyn can win a general election. Ms Dugdale, who backed Owen Smith, said last month she didn’t think Mr Corbyn could “unite our party and lead us into government”. But she said the conference should be a “new beginning” for the party. A united Labour party talking about its principles can win, Ms Dugdale said. Asked if that included with Mr Corbyn as leader, she said “of course”. Ms Dugdale has also urged the Parliamentary Labour Party to “recognise that a divided Labour Party serve no one”. Video caption: Re-elected leader Jeremy Corbyn tells BBC political editor about uniting the Labour Party.Re-elected leader Jeremy Corbyn tells BBC political editor about uniting the Labour Party. Re-elected leader Jeremy Corbyn tells BBC political editor Laura Kuenssberg the debate about leadership is "now over"
"I'm glad this election is over," says Labour deputy leader Tom Watson. "It's been a very bruising summer for the Labour Party." Quote Message: I think we are looking at an early general election and that must now be our sole focus: taking on Theresa May and the Tories." I think we are looking at an early general election and that must now be our sole focus: taking on Theresa May and the Tories." More from the defeated Labour leadership candidate, Owen Smith, who has congratulated Jeremy Corbyn on what he called a "decisive victory" but warned that the party is "still at risk" of not looking like a credible alternative to the Tories. He told the BBC: "I'm very very proud that I had the chance to stand in this contest and attempt to be the leader of the Labour Party. I'm incredibly humbled that almost 200,000 Labour Party members and supporters put their faith in me and I'm pleased to hear that Jeremy now wants to unite the party and get us back to where we need to be which is looking like a government in waiting, looking credible and winning the trust back of the British people." Mr Smith said Mr Corbyn needs to be congratulated for having changed the nature of the Labour Party, having significantly changed the electorate of the party and gaining 60% of that support. 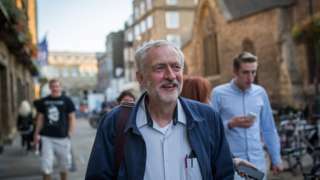 He warned that the party is still at risk of not looking like a united and credible alternative to the Conservatives and Jeremy Corbyn now had a much bigger challenge of trying to win the country, having won the party. Jeremy Corbyn says shadow cabinet elections could be considered as part of discussions on Labour Party democracy and insists that his MPs should not worry about deselection. "There is a need to strengthen democracy within the party. We are now a party of more than half a million members and so there has to be a discussion about democracy in the party and that includes the proposal for elections to the shadow cabinet and that is absolutely in the mix." Quote Message: Well there is no need to worry because it’s all about democracy. We are all democratically accountable to our party and to our constituents. They have no need to worry at all. I’m reaching out." Well there is no need to worry because it’s all about democracy. We are all democratically accountable to our party and to our constituents. They have no need to worry at all. I’m reaching out." Jeremy Corbyn tells the BBC that the numbers of people who got involved in both his and Owen Smith's campaign "shows that democracy and participation are very vibrant and vital within the Labour Party". And he disputes the extent of divisions withing Labour. "The party is united actually on the economic strategy, united around education ideas, united around the National Health Service, united around the inequality and injustice that exists in Britain," he says. "And now that this election is over, and it is over, the whole party has an opportunity to come together to put that message out. You will see over the next few days here in Liverpool, wonderful city of Liverpool, that’s such vibrant heart, and such a brilliant future. You are going to see the same thing for the Labour Party."